Historic Florida Militia, Inc ~ Presenting the Past to the Present for the Future. The School of the 16th Century is an event designed to tell both the public and the aspiring re-enactor everything they wanted to know about the 16th century. 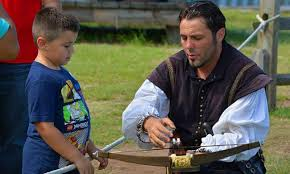 For the visiting public it is an opportunity to learn how to fire a crossbow, fire a musket or even a cannon. It also presents the opportunity to learn about clothing, cooking, and other skills in use in the 16th century. 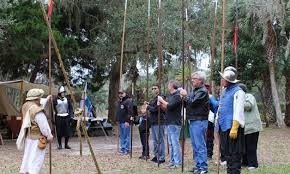 The event takes place on the first Saturday in February on the grounds of the historic Fountain of Youth located at 11 Magnolia Avenue in St. Augustine from 9AM to 5PM. Check our calendar for specific dates. Colonial Quarter Museum- Journey back in time through the history of St. Augustine. From our distinctive 35-foot watch tower and colonial buildings to shops and dining. Fountain of Youth- We invite you to visit us for a fascinating, informative, entertaining tour of Ponce de Leon’s Fountain of Youth Archaeological Park, the original site of the Nation’s oldest city. Located in the area first explored by Juan Ponce de Leon in 1513. Castillo de San Marcos National Monument, St. Augustine, FL- A monument not only of stone and mortar but of human determination and endurance, the Castillo de San Marcos symbolizes the clash between cultures which ultimately resulted in our uniquely unified nation. Ft. Matanzas National Monument, St. Augustine Beach, FL- Fort Matanzas guarded St. Augustine’s southern river approach. The colonial wars are over, but the monument is still protecting—not just the historic fort, but also the wild barrier island and wildlife. Ft. Mose State Historical Park, St. Augustine, FL- Historic site of a free-slave settlement, preserving history and natural beauty. visitstaugustine.com- Visitors will find an array of attractions in the nation's oldest city. From living history museums like the Castillo de San Marcos to Gilded-Age hotels, swashbuckling adventures and specialized tours in the air, on the sea, and in the heart of the historic district, Saint Augustine has it all! St. Augustine Pirate and Treasure Museum- The Museum offers an exciting and educational museum experience that transports you and your family back in time over 300 years to Port Royal, Jamaica, at the height of the Golden Age of Piracy. ST. JOHNS CO. CULTURAL COUNCIL- HistoricCoastCulture.com is a one-stop source for information about all the performances, venues, exhibitions, and community events that are happening year-round in the St. Augustine area. The Spanish Bakery- A local baker's blog and home of many tasty treats. Right off St. George Street. Old Town Trolley- Trolley Routes & Stops with a lot of helpful information on St. Augustine's Points of Interest, Shopping & Entertainment, Restaurants & Bars and much more! Lghtner Museum- Lightner Museum is housed in the former Alcazar Hotel built in 1888 by Henry Flagler. Today it is home to one of the finest collections of fine and decorative 19th century art in the country. The Museum is open to the public seven days a week and features self-guided tours, tours by reservation for adults and children, and demonstrations of antique mechanical musical instruments. Plan your Stay in St. Augustine | Ponte Vedra Today!